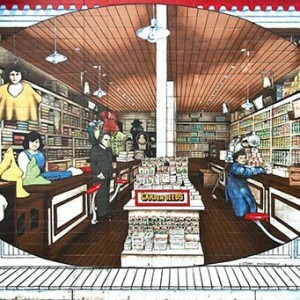 Using an oval format, this mural shows an interior depiction of the Victoria Lumber & Manufacturing Co. Ltd. store, circa 1917. 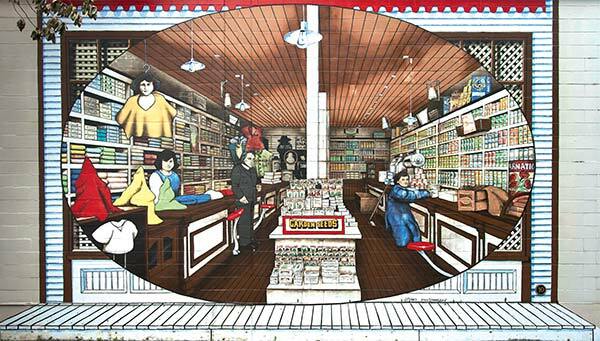 The artist recreated the deep perspective of the colourfully-laden shelves from old photographs. D.A. Gatus was the store manager. He is seen standing in the mid-ground. Ann Porter worked as a clerk, and is pictured on the left behind the counter. The V L & M Co. Ltd. used one of the first known credit card systems in the store. The purchaser would pay for the goods with coupons. In turn, the store would receive credit for the same from the company, which would deduct the amount from their employee’s pay cheque. The name “Victoria Lumber & Manufacturing Co. Ltd.”, and its trademark, the letter “V” in a diamond, became known throughout the world.